One of the students I teach told me that she had recently visited a police station to observe a mental health team. The police sergeant asked whether she’d like to go into the police cell for a short period of time; she agreed. She told me how struck she was by this experience, one she will never forget. Perhaps it would be valuable for psychologists working in prisons to have an experience like this, of spending some time in a prison cell, in order to get a sense of this day-on-day experience of prisoners. Of course, I doubt that a short stay would come close to capturing what it is actually like to be locked in a small space, unable to ask someone to let you out when you want. But from my experience as a prison researcher and then as a psychologist in prisons and other secure settings, it has long struck me that in order to practise effectively as psychologists, we must at least try to acquire a detailed understanding of the daily lived experience of prisoners. Such attunement to prisoners’ unique experiences would help us to direct our practice to promoting recovery in a meaningful way. In their 2012 book Secure Recovery, Gerard Drennan and Deborah Alred usefully summarise the principal spheres of recovery for people with mental health difficulties as clinical, functional, social and personal. They also add to that list ‘offender’ recovery, which they define as ‘coming to terms with having offended, perceiving the need to change the personal qualities that resulted in past offending, which also create the future risk of reoffending, and accepting social and personal consequences of having offended’ (p.15). I would suggest that in order to help prisoners recover from their past experience of offending and prevent future similar experiences, we must first understand their current experiences, psychological and social, of imprisonment. Before I trained and worked as a clinical psychologist in forensic settings, I spent time as a criminologist and prison ethnographer. The ethnographer watches what happens, listens to what is said, and asks questions, in order to understand those people’s experiences holistically (Hammersley & Atkinson 1997). The ethnographer aims to develop a ‘thick-description’ (Geertz 1973) of the subjective lived experience of the group with whom she or he has spent a long spell of time. Ethnography involves learning from people rather than studying people (Spradley 1980), so the ethnographer does not come in to a culture taking an expert position. This was my initial experience of working with prisoners, during my doctoral research on the psychosocial experience of prison for young adults aged 18–20, when I spent a year at HMYOI Feltham (Harvey, 2007). I interviewed young people and staff, and carried out social network analyses of the relationships between prisoners. But also, as part of my ethnographic approach, I was given a set of keys and spent a substantial period of time observing the practices of everyday life, shadowing, observing and interacting with staff and prisoners. As a student and ethnographer, rather than a practitioner then, my reason for being there was to understand – to capture the detail of life there and to witness the ebb and flow of social relationships. That experience has shaped my later practice as a psychologist in secure settings: I have continued to try to comprehend the lived experience of prisoners in these confined spaces. In my practice (and in this article) I continue to draw not only on some of the findings from my doctoral research but also on some reflections on the process of carrying out such an ethnography. So what do we know about the experience of imprisonment? There is a wealth of studies of prisoners’ culture and the psychological experience of confinement (Liebling & Maruna 2005). Research has explored what prisoners import with them into prison, the deprivations of the prison environment and the interaction between the individual and their environment (Toch, 1992). We know that prisoners import with them a range of psychological and social difficulties and that being in prison presents further challenges or ‘pains of imprisonment’, a term favoured by Gresham Sykes (1958) in his classic text The Society of Captives. Sykes identified these pervasive pains as the deprivations of liberty, goods and services, of contact with family and friends, of autonomy and of security. Of course, while the pains of imprisonment are well documented, it is important to note by contrast that, for some people, imprisonment might feel like a relief from a difficult life outside and that some prisoners become attached to the prison. That said, a person’s life outside prison must be very difficult, if prison, with its controls and deprivations, is preferable. And even if a person is more attached to the institution and has learned to navigate it, the experience of imprisonment is still full of difficulties. In the prison, there are specific dangers, from increased prevalence of bullying and high rates of self-harm and self-inflicted deaths (Ireland 2002; Liebling, 2007). There are also more general difficulties: experiences of ‘fear, anxiety, loneliness, trauma, depression, injustice, powerlessness, violence and uncertainty’ have been identified as common to prison life (Liebling & Maruna, 2005, p.3). Irving Goffman’s classic study also reminds us of the profound impact that imprisonment can have on a person’s basic identity: he describes the process of entering the ‘total institution’ as a ‘mortification of the self’ (Goffman 1961, p.25) and ‘personal defacement’ (p.29). I too was interested in the entry point into custody and, in my ethnographic study, examined how young men adapted to the first month in custody. Some common themes emerged about their experience: a preoccupation with safety, a sense of losing control and freedom, feelings of uncertainty, and separation and loss. I interviewed the young men longitudinally after 3, 10 and 30 days in custody and found that the young men who had the most difficulty regulating their emotions and had higher level of psychological distress after three days still found it most difficult to adapt to life in prison after 30 days as well. In my study, the variables that significantly accounted for variance in psychological distress for people after three days in custody were their locus of control and their perceptions of their own adaptability. Their sense of safety also showed a significant correlation with their levels of distress. Individuals with an internal locus of control were able to find ways of achieving at least some sense of autonomy within this limiting environment, and did not feel completely determined by their experience. These young men were able to find jobs in prison or take up the education on offer. However, those who scored higher on an external locus of control were more distressed. Perceived adaptability, that is, the young men’s own sense of whether or not they would be able to cope with prison life, also significantly predicted variance in psychological distress. Those who reported that they found it difficult to adapt to life in prison, or could not cope with the experience, were more distressed. Safety also appeared as an important variable. How safe a young person felt in this environment had profound implications for his wellbeing and ability to engage in interventions that were on offer. Such differences have significance when thinking about what might be needed to help a prisoner along the journey of recovery. Why, though, do we need this understanding of the experience of imprisonment as a prerequisite to our practice? First, there are ethical reasons for improving our knowledge of the pains of imprisonment and the process of adaptation. If we are not thinking fully about the painful nature of secure confinement, we are then not validating, or indeed are invalidating, the experience of the thousands of people who are locked in our prisons today. Moreover, if we as practitioners do not place their experience at the centre of our thinking about psychological provision, then we are not going to contribute to the amelioration of the potential harmful effects of imprisonment. The daily experience of life in prison should be considered throughout our assessments, formulations, interventions, evaluation, audit and research, training and consultation. Recognising the pains of imprisonment would ensure that we tailor our services to the needs of prisoners and to the amelioration of the pains of imprisonment. Consider the construct of psychological distress, and my measure of it in my past study. Can conventional, standardised notions of depression or anxiety aptly capture psychological pain that might be, in some part, induced by the prison itself? When developing therapy provision in prison (Harvey & Smedley, 2010), context should be uppermost in the mind of the applied psychologist. If we were to focus solely on the delivery of specific interventions for specific psychological difficulties, then we might risk our interventions being too atomised and attending to individual factors at the expense of attending to systemic factors. A detailed exploration of the pains of imprisonment should be routine practice. Such a contextual understanding of the client’s current experience might also inform interventions focused on specific offences. For example, the first place to start might be on helping prisoners cope with being locked up and separated from loved ones, before considering their offence. We might even ask whether we should be offering more interventions that centre on coping with imprisonment, alongside offence-focused work? Finally, we might recognise that the very environment where psychological provision is being offered has the potential to do harm. We need to ensure that we deliver interventions that are safe and bear in mind individuals’ responses to imprisonment. For instance, there are significant ethical and practical challenges in carrying out trauma-focused work in an environment that might be perpetuating the trauma. How do we ensure that the client is able to cope following a psychology session when they then might be locked up for a substantial period of time? Moreover, we might make more central to our practice the task of working closely with prison staff to help staff understand how an individual’s presentation might result from what the individual has brought with them into the prison, so pre-existing vulnerabilities, but also how the environment itself interacts with the individual. Image: Therapy Chair, HM Prison Grendon. Courtesy of the Koestler Trust. But how, in practice, could we go about understanding the pains of imprisonment, or making them more central to our work? First, we might think differently about preparing psychologists for work in prisons. Induction programmes for new staff could include time to focus explicitly on the effects of imprisonment. Such programmes could make time to think about the psychological effects of imprisonment for prisoners, but to consider the impact on the psychologist too. It might be useful for some of the findings on the effects of imprisonment to be shared. Importantly, it might be useful for former or current prisoners to talk about their experience, although this would require careful thought in order to ensure that the space felt safe and contained. Likewise, it is important for psychologists to be oriented to the demands in the role when working in prisons and for there to be a space to allow new psychologists the opportunity to voice their hopes and fears and to be offered support. Of course, the role of ongoing clinical supervision is also paramount. Second, I am wondering whether it would be useful to borrow some of the methods of ethnographic research for use in psychological practice. As mentioned above, at the heart of ethnography is the attempt to understand and learn from the particular group of people. Could psychologists from time-to-time adopt the role of the ‘participant-observer’ and be freed from routine assessments and interventions, actively to observe and reflect on micro-moments of prison life, as an ethnographer might? This could yield useful reflections that might be helpful for practice. Psychologists, normally presenting themselves as ‘scientist-practitioners’, could develop themselves also as ‘ethnographic practitioners’ when working in prisons – or indeed in other social contexts – and have at least some time to use the method of ethnography in their practice (Harvey 2015). Such moments could include shadowing staff, carrying out detailed observations of social interactions on the wing, attending adjudication meetings, spending time in different areas of the prison and absorbing and making sense of the culture. For example, when I carried out my ethnographic study at HMYOI Feltham, I was able to walk around the prison and observe what was going on without being there as a practitioner with tasks to do. I was able to spend time in the visits hall and observe the young people before, during and after visits. This gave me some insight into the complex emotional experience of a visit and the ways that emotions shift during this process. Learning from such observations could be a useful complement to hearing clients’ reflecting on their responses to visits in a psychology session. When a prisoner says that he no longer wants his loved ones to visit, say, a psychologist would be better attuned to what might prompt such an assertion. Finally, in our practice, we might consider the ‘pain quotient’ which has been conceptualised by O’Donnell (2014, and this issue, p.000) in his writing on the experience of long-term prisoners. He identifies two variables that affect this quotient: the time the person has left to serve in prison and the likely lifespan remaining to a person of this age after the sentence. I think a broader conceptualisation of the ‘pain quotient’ could be useful when working clinically with prisoners to ensure we are thinking about their level of potential pain, as it might inform our contextual understanding of their experience. Of course, prisoners vary in length of sentence, and their age, but they also vary in the personal and social resources they bring with them into the prison. Such personal and social resources could impact upon the level of pain experienced. Furthermore, we know that prisons themselves vary in their ‘quality of life’ (Liebling, 2004), and some prisons might be experienced as more painful than others. It would be useful to measure pain at both an individual and prison community level, and consider the interaction between the two. Perhaps we need to capture the notion of pain in those micro-interactions, and an ethnographic approach might help us do so. Through developing such a detailed ‘thick description’ of the prison, we could then develop deeply contextualised interventions aimed at reducing the experience of pain. Of course any such work in assessing and formulating the prison, as well as the prisoner, is limited by the finite resource of time; but such time could be useful if reflections from these observations and interactions were fed back to inform practice. Considering the prisoners’ experience with an ethnographic attitude could open up different avenues of discourse with our clients, and help us to develop psychological services that are truly attuned to their needs. ‘My own interest in tracing the experience of imprisonment stems from time spent as a criminologist and prison ethnographer, before I trained and worked as a clinical psychologist in forensic settings. The practice of ethnography, which was developed by social anthropologists, involves spending time with a group of people in order to understand their experience. - Joel Harvey is a Lecturer in Clinical Psychology at the Institute of Psychiatry, Psychology and Neuroscience. 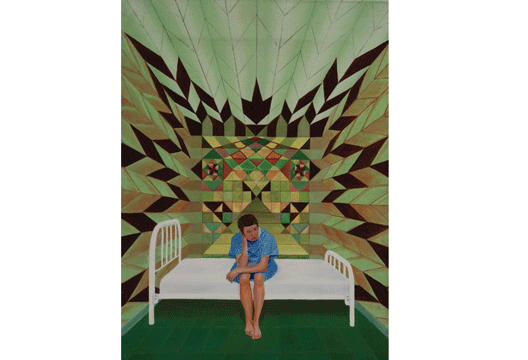 Image credit: Demon in Solitary, HM Prison Littlehey, Grayson Perry Bronze Award. Courtesy of the Koestler Trust. Drennan, G. & Alred, D. (Eds.) (2012). Secure recovery. Abingdon: Routledge. Goffman, E. (1961). Asylums. London: Penguin. Harvey, J. (2007). Young men in prison: Surviving and adapting to life inside. Cullompton: Willan. Harvey, J. (2015). The ethnographic practitioner. In D. Drake, R. Earle & J. Sloan (Eds.) The Palgrave handbook of prison ethnography (pp.390–402). Basingstoke: Palgrave. Harvey, J. & Smedley K. (2010). Introduction. In Harvey, J. & Smedley K. (Eds.) Psychological therapy in prisons and other secure settings. Cullompton: Willan. Ireland, J. (2002). Bullying among prisoners. Hove: Brunner-Routledge. Liebling, A. (2004). Prisons and their moral performance. Oxford: Oxford University Press. Liebling, A. (2007). Prison suicide and its prevention. In Y. Jewkes (Ed.) Handbook on prisons. (pp.423-446). Cullompton: Willan. Liebling. A. & Maruna, S. (Eds) (2005). The effects of imprisonment. Cullompton: Willan. O’Donnell, I. (2014). Prisoners, solitude and time. Oxford: Oxford University Press. Spradley, J.P. (1980). Participant observation. Orlando, FL: Harcourt Brace Jovanovich. Sykes, G. (1958). The society of captives. Princeton, NJ: Princeton University Press.